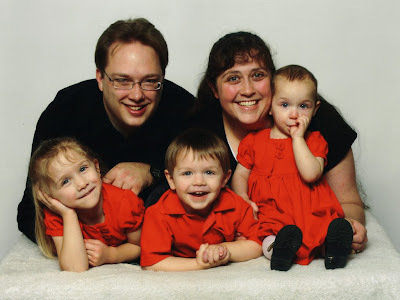 Moments & Musings: "We interrupt your program to bring you..."
...Our Family Photo for 2009. So, I finally got our family picture scheduled (a month and a half late), and now we've gotten the pictures back from the lab. This means that all I have to do, is sort out which picture goes to which recipient, and I'll have finished one more project. It might take a while this time and it won't be due to my distractedness. Our scanner is broken - in fact, I had to 'fix' this picture so I could post it without a bold, black line skewering our heads. When Sir gets the other scanner hooked up and working, we'll be able to scan a good copy. Then we can print out and send decent sized pictures to the long line of family members and friends who would have been stuck with a teeny tiny miniature size picture. And a mini with five people in it is absolutely ridiculous! Yeah, this package had 16 - SIXTEEN minis and only 8 wallets. Once upon a time you'd get 21 wallets and 4 token miniatures, but I shouldn't complain, the package deal this time was only $5.00 - who knows, they change the package size and price around every month, so maybe next time will be better when it comes to quantity. I just love this photo. It is so YOU GUYS. Emma looks so cute and the other two look so happy, the photographer did a good job of entertaining them. Chasm's Lady- you're a real Canadian now with that "eh?" slipped in there at the end of your comment! Hey, love the photo! You all look great and even Sir has a real smile! :) Like the color combo too. Emma is darling with the thumb in the mouth and Hannah and Judah are perfectly themselves if that makes any sense at all!